Sitting beside none other than YouTuber Saabkyle04 in a GMC Yukon, I was quietly and comfortably chauffeured from the Detroit Metropolitan Airport to the Russell Industrial Center. It certainly looks industrial from the outside, a run-down aesthetic amplified by the morning rain. If I wasn’t led into the building, I would have thought it was some abandoned factory. Exiting the Yukon via its automatic power running boards, I walked by the latest offerings of the GMC Denali line. I saw the Sierra HD, the Yukon, the Terrain, and the Acadia all wearing their finest clothes and shiniest grilles welcoming me to the unveiling of the all-new 2019 GMC Sierra, specifically, the range-topping Denali alongside the second nicest Sierra, the SLT. After a little waiting around in the Denali Lounge (yes, there was a sign on the door that said “Denali Lounge”) being watered and fed by GMC and poring over the press release for the 2019 Sierra, I was escorted to a stage with GMC signage everywhere and images teasing the new truck I was about to see. Then, after a corporate hype man did some talking about how well things are going at GMC, the all-new 2019 GMC Sierra drove onto the stage to some very Michael Bay sounding music. Note that the word "Denali" is bigger than "Sierra." Remember, Denali isn't a trim, it's a subbrand. The design of the 2019 Sierra falls nicely in line with the emerging new GMC design language. Personally, I think the new Silverado is not a good looking truck and the Sierra is a nice, premium-looking antidote to the Chevy’s ugly mug. I haven’t seen the two trucks side-by-side, but I think the Sierra hits home the refined, upmarket positioning that GMC is going for with the new pickup. It’s bigger than the outgoing model and it shows not just in the actual size difference, but in the design with the tall stance, big grille, and a rather dramatic interpretation of the C-shaped lighting that’s been making its way through the GMC lineup. The interior follows the exterior’s lead. It’s roomy with a driver-centric cockpit and it claims best-in-class maximum front head and legroom. The rear passengers get an extra three inches of legroom in the crew cab over the previous model. The lush interior of the new GMC Sierra Denali is the closest you can get to a new Cadillac pickup truck. It’s generously appointed with premium materials, advanced tech, and an overall design that’s easy on the eyes. It’s a great place to be when your truck is eating up miles on the highway or hauling your payload on the worksite. Wood interior trim in pickup trucks is nothing new, but this textured, open-pore wood trim in the Denali is an attractive change from the smooth wood veneers we’re used to seeing in high-end trucks. It reminds me of handmade wood furniture you would find in a ski lodge: Rugged, yet refined. The non-Denali interior is nice too and even nicer if you don’t have the Denali to compare it to. You get the same roomy cabin and while the SLT has fewer luxuries than the Denali, it’s still a very nice truck interior for this price point. If you have Denali money to spend, by all means, spring for the Denali, but you won’t regret settling for the SLT. Here’s some of the new tech highlighted in the 2019 Sierra. 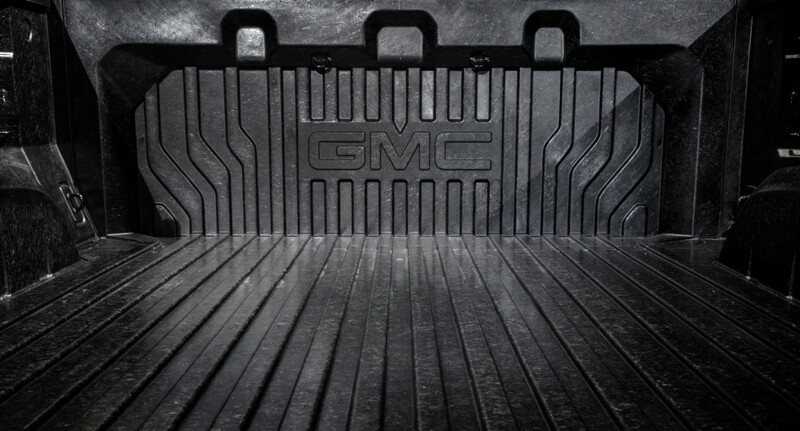 It has what GMC calls the MultiPro tailgate. It has six unique functions and positions so you can set it however you need to in order to load or unload your cargo or climb in and out of the bed as efficiently and comfortably as possible. This is something you can’t get in the Silverado, at least not yet. 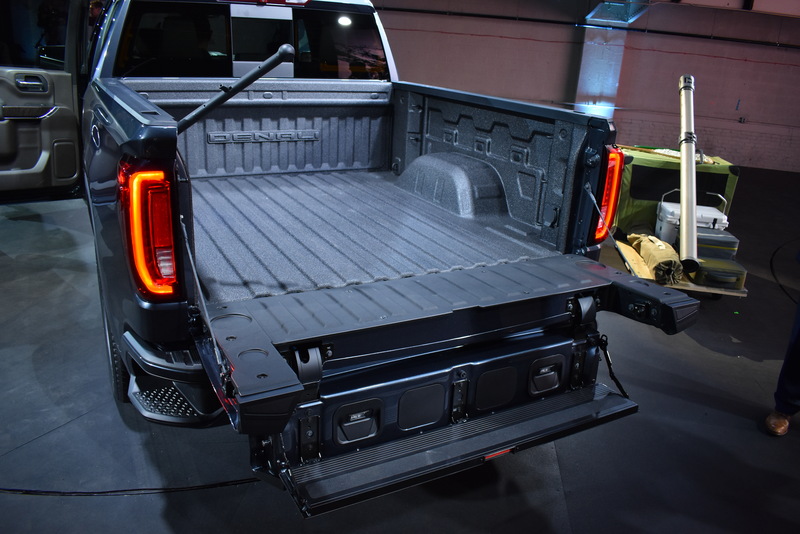 When you think of carbon fiber, you probably think of lightness being added to performance cars, but GMC found a good use for it in the new Sierra. 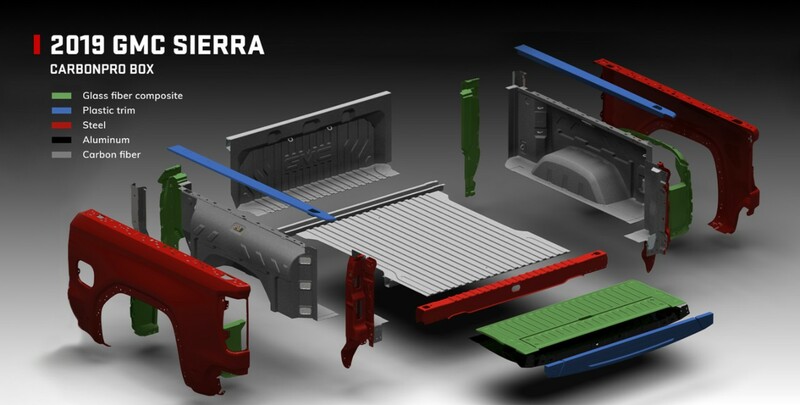 The new truck will have an available industry-first carbon fiber pickup box later in 2018. It’s easy to see the advantages of the extremely high strength-to-weight ratio of carbon fiber for a pickup truck. It’s called CarbonPro and it promises higher strength, lower weight, and tougher dent and scratch resistance than the competition. Also, it just looks cool. 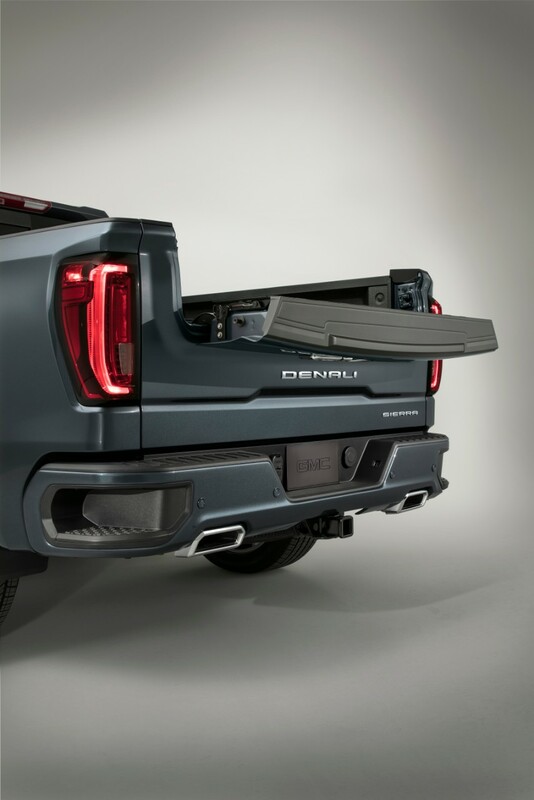 The new Sierra allows you to tow with confidence with the new ProGrade trailering system with a trailering app. It has a sophisticated camera system giving you eyes on both sides of your truck and even behind the trailer. It can even tell you the pressure and temperature of your trailer tires which can help you prepare for or prevent a blowout. Much more than a gimmick, the ProGrade system will make towing easier and safer. Speaking of looking behind you, the 2019 Sierra borrows some Cadillac tech with a rear camera mirror, a segment first. When you put the Sierra in reverse, the rearview mirror becomes a backup camera and switches back to a mirror when you shift out of reverse. It even allows you to tilt and zoom the camera to your liking. This is especially useful in a pickup truck in which passengers and cargo might normally obstruct your view behind you. Head-up displays are becoming more common in luxury cars and the Sierra is getting in on the action. More than just a speedometer projected on the windshield, this is a multi-color 3-inch by 7-inch HUD with customizable vehicle data. And you thought the HUD in the old Buick Rendezvous was fancy. “Capability and refinement” sums up the new Sierra nicely. It gracefully follows the trend of trucks moving further upmarket, without sacrificing ruggedness, while still having something to offer for drivers in lower tax brackets than the Denali clientele. We don’t know much about the lower trims of the new Sierra yet, but just about any discerning shopper in the market for a new full-size pickup should be able to find a GMC Sierra that suits their wants, needs, and budget just right. GMC's efforts to establish itself as a luxury truck and SUV brand are paying off. Another new face is coming to the truck market. Step up—literally—to the next level of camping, with a truck bed tent in the back of a full-size pickup. The 2018 GMC Sierra 2500HD All Mountain concept is a snow-climbing beast set to debut this week in Colorado.